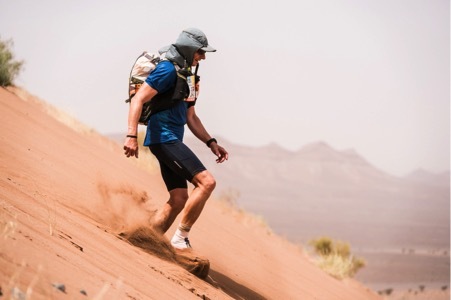 I recently returned from completing Marathon Des Sables, a 155 miles race across the Moroccan desert. 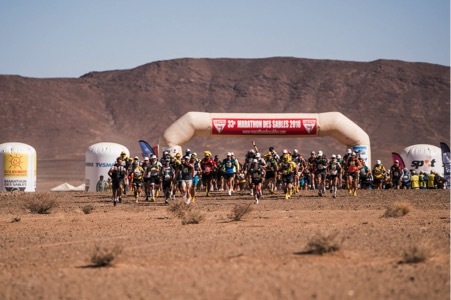 The race, known as “the toughest foot race on earth”, is the stuff of legends. 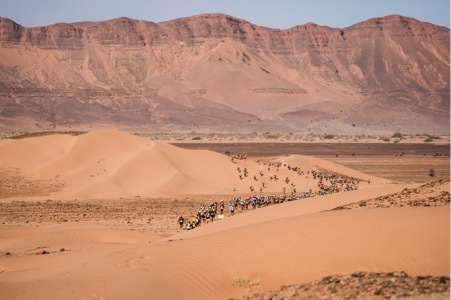 Every year approximately 1,000 competitors from more than 50 countries participate in this mad race across an immense landscape of endless dunes, rocky jebels (mountains), dried-up river beds, white-hot salt plains and end-less plateaus deep in the inhospitable southern Moroccan Saharan desert, a 6 hour bus drive from the nearest major town. It is a multi-stage adventure race over 7 days, where we have to be self-sufficient. Apart from rudimentary Berber tents (which are taken down very early each morning and moved to the next camp) and rationed water handed out at infrequent check points, we carry everything for the week on our own backs including food for the week, medical supplies, sleeping bag, sleeping mat, compulsory equipment (e.g. venom pump, compass, map and whistle) and clothes. Life becomes very basic during the seven days in the desert. Mobile phones are left behind, and the focus is now just on running, drinking enormous amounts of water (more than 10 litres per day), trying to sleep on the stony desert floor, consuming the meagre food rations we carry, protecting our gear, repacking the backpack, taking care of feet and body, and yes of course using the loos. It is far from as romantic as the picture above may portray. Inhibitions quickly disappear in this environment. We get two brown plastic bags each day that we use in these basic cubicles – I’ll leave the rest to your imagination. Water is rationed, there are no showers and you also want to travel as light as possible, so you stay in the same clothes throughout the week (so, no it is not a good tan I have in the pictures – it is red sand and dirt!). The daily start of the race becomes a magnificent ritual. 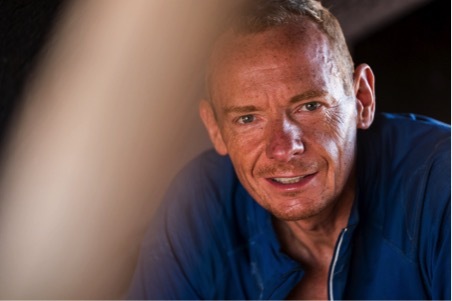 The 1,000 competitors assemble at the start line and helicopters hover overhead as the charismatic Frenchman, Patrick Bauer, who started the race more than 30 years ago, sets us off to the sound of Highway to Hell blasting out over the desert. The temperature during the afternoons reaches into the high 40s centigrade and at night gets perilously close to freezing point. The heat and distances test the resolve and bodies of the competitors, with swelled, blistered, bloody feet and rows of tired runners waiting at the doctor’s tent a daily spectacle (I will spare you the pictures – but if you do a search on Google for “Marathon des Sables feet” you will get the idea). 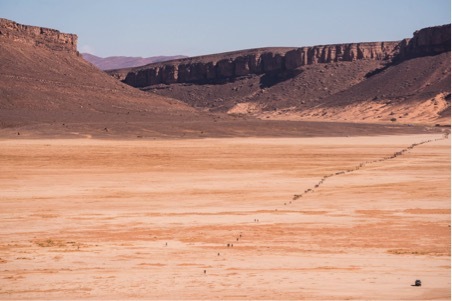 The first three days of running leads up to the most feared part of the MDS – the long stage. It’s a double marathon distance of 54 miles in one go over really, really tough terrain. The soft sand dunes were heavy going and seemingly end-less, we climbed more than 4,000ft, the temperatures reached 48 degrees in the afternoon and we were hit by a sandstorm as darkness fell. I arrived into camp in darkness after 13 hours of running to find that our allocated tent had collapsed as had most of the other 146 tents. It took me almost an hour to get a semblance of a tent raised, so I could lie down. I was too tired to clear the ground for stones, so I just collapsed, had a little bit of food and crept into the sleeping bag, waiting to greet my team mates as they arrived back through the night and the next morning. I’ve seen television programmes on the Discovery Channels about the MDS for several decades. I always thought it was a mad race, done by superhuman athletes. 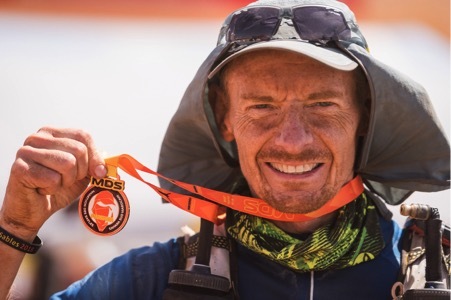 I never saw myself in this until I completed a 107-mile ultra-marathon a few years ago, and then started to look for the next bigger challenge. But, what is the ultimate? 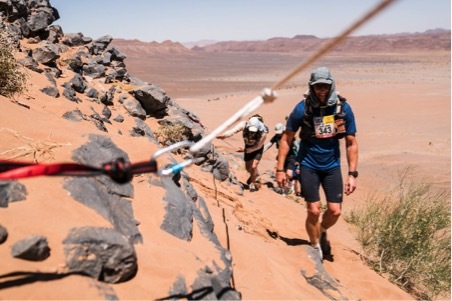 Marathon des Sables, of course! The distance, logistics and the circumstances of this race make it a huge commitment in terms of training and preparation. I signed up as an individual, but when attending an ultra-run training weekend in the Brecon’s in Wales, I met a group of likeminded mad ultra-runners, who had also signed up for the 2018 MDS. We formed a ‘Tent Club’ of 8 people, who supported each other along the way, sharing learning, tips and ideas. 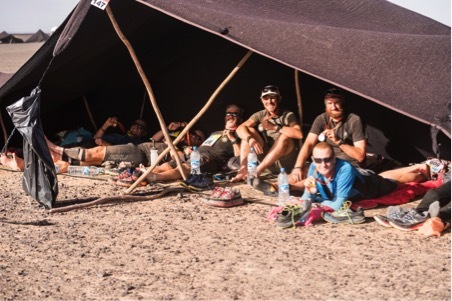 We ran some preparation races together and then shared a tent in Morocco. The fun, camaraderie and friendships formed would become the best part of the whole MDS experience. Was it hard? Yes, the distances, terrain and heat make it tough, but these are expected, and you can to a large extent prepare for these both mentally and physically. The bigger tests come when things go awry or not according to plan. For example, stepping on a 1.5-inch thorn that entirely penetrated my trainer and deep into the sole of my foot (I pulled it out and ignored it); or the sandstorms, which resulted in some sleepless nights as the Berber tents collapsed around us and the heavy goats-hair canvas slapped us continuously throughout the night while sand filled the sleeping bag, where I had also dragged in all of my kit to protect it (I told myself: “This is just part of the desert experience. Don’t spend energy on getting annoyed at something I can’t control.”). Another surprise was the freezing cold during the nights and early mornings. During the night we would creep into our sleeping bags at 7pm in all our clothes. 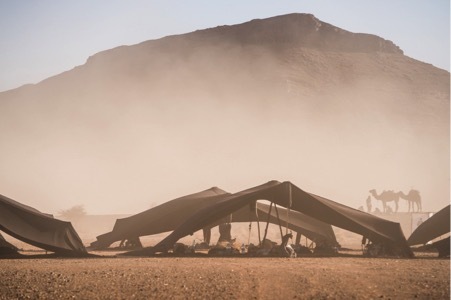 In the mornings the Berbers would take down the tent around 6am which left us completely exposed to the wind and cold two hours before the race-start and hours before the sun starts to give us some decent heat (Again I told myself “It’s part of the desert experience”). Were there upsides? Yes, indeed many: The Moroccan landscape we traversed is truly magnificent, beautiful, majestic and awe-inspiring. 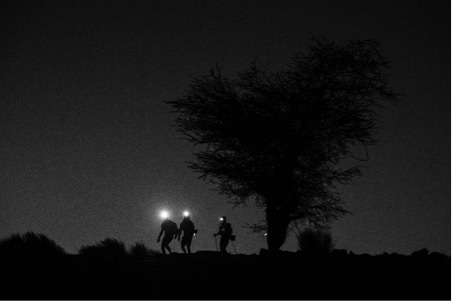 The sense of achievement when reaching the top of a jebel (mountain) and arriving into the camp after a gruelling stage were immense. The laughs and camaraderie in the tent topped it off, to make it a truly fantastic experience that I would highly recommend. 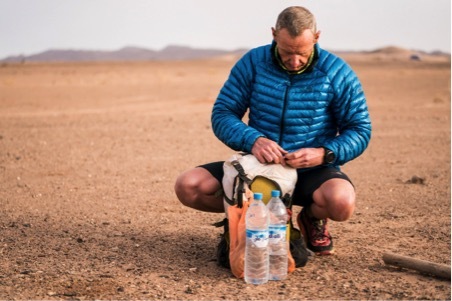 The amount of effort to prepare the body and feet for running such extreme distances and conditions, acclimatising, buying and testing equipment and food was immense, and pretty much took over my life for the 18 months leading up to the race. The list of things I learned about equipment, food and preparing for such a challenge is long (and I’m happy to share if you are considering attempting this yourself). But, on reflection, what did I learn about myself? Would you do it again? This is the most frequent question I get from friends and family. No, I wouldn’t! But it is not because it is hard, but rather that the main motivation for me to do such challenges is the journey and the learning along the way. The race is ‘just’ the culmination of these, the test of whether I got it right. If I was to do it again, I have already been through that journey, so the intrinsic motivation would be much less. The butterflies I had when I stood on the start line, “can I do it when it counts?”, would not be there in the same way. Getting another medal or improving my final race position are not strong motivations for me. I will undertake other different epic challenges in the future, but they will be different challenges. And it will not be anywhere in the near future, as I need to spend more time with my family now. Planning and preparation are essential for a good race, but like in many endeavours, they can only take you so far. 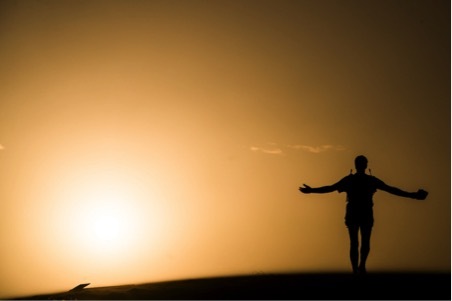 Resilience and a positive mindset were key factors that brought me through collapsing tens and sleepless nights, and they pushed me forward during sandstorms and high heat (I am of course also a stubborn so-and-so!). Am I a team player or best on my own? I’ve been reflecting on this. When I am racing and pushing myself, I prefer to be by myself, setting a pace that suits me. I was not very talkative or social when running. 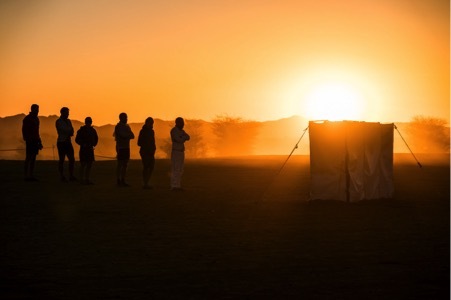 But, I really loved having the Tent Club team with me along the journey, during the many months of preparation and when returning to the camp each day. I do also recognise these characteristics in my work and in my psychometric profile. Oh, and importantly for any business owner: Our business did not collapse even though I was away and didn’t have access to emails or phone for 10 days. Actually it ticked on quite nicely while I was away !! And finally, for anyone interested: I finished in 147th place overall in 33 hours and 4 minutes, wildly exceeding my expectations.